Using his trusted band of musicians Hayward delivers 38 minutes of varied tunes with a combination of sardonic humour and wry observations about life in the latter half of the 2010s. Recorded in a variety of locations between January 2015 and May 2017 Boz, who had moved on to other projects, was encouraged to complete the album by guitarist Phil Robinson, a key collaborator on the set. Boz says there are no obvious influences for the album other than perhaps 60s music and in particular what he calls the “4 B’s” of the ’60s – Beach Boys, The Beatles, John Barry and Burt Bacharach. However there was a clear intent to write a few songs with a country feel, given the Tennessee location and this is the most of obvious in “Night of the Fireflies” “Trail of Tears” and “The People Are Good”. But as with any release from Hayward the sounds vary between quirky alternative pop in the spirit of Ray Davies Kevin Ayers or Robyn Hitchcock, Morricone soundtracks, Klezmer, a hint of lounge jazz, and gentle country/folk/blues. There are surprises, notably on the opener “Totally Weird” which includes some intriguing interventions. It is the most personal songs in the collection that have the greatest impact. Particularly the beautiful “Night of the Fireflies” which is the stand out track on the album. Written for his Aunt, which she got to hear on the second family visit, this is Boz at his best. The biographical “Patsy Lane”, the name she went under when she sang in pubs/clubs and some bigger venues across northern England in the 60s. The trilogy of tunes which form the early part of the album concludes with “The Trail of Tears” the main road up the mountain near her home in Tennessee, a place where she decided to settle because”The People Are Good”. References to native American culture emerge in the dialogue as Hayward maintains a thematic consistency in these and other songs on the album. Boz’s penchant for abstract musical imagery is coupled with similar lyrical endeavours throughout the album and particularly on “In My Little Bubble” and “The Lexicon of Life” the latter of which makes particularly pointed comments about the trials of modern employment. Exceptional musicianship is a key component of the success of the album. Boz’s self deprecating comment that he writes “simple songs” with a “limited style” doesn’t quite fit with the quality of the album. It is beautifully arranged with well known musical elements being evident but not obvious. The album reminds me, to some degree, of one of my favourite releases Bert Jansch’s “LA Turnaround” where the legendary folk star worked with Mike Nesmith to expand his sound. The easy going, effortless, delivery together with excellent songcraft is reminiscent of another local iconoclast Vinny Peculiar. Hayward’s work generally splits into three broad areas – his more strident punky work, the cinematic soundtrack vignettes, and this more song based approach. One can find excellence in all three strands of his output but this perhaps the place where hopefully he will get the attention and recognition he deserves. 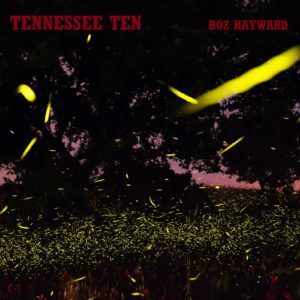 The post Boz Hayward to release ‘Tennessee Ten’ – a poignant modern folk album appeared first on Louder Than War.